The Venom is known to fly missions with AH-1Z Vipers in Iraq and Afghanistan. The Marines just don't want to get rid of the Huey, so they redo it. Four rotors. Known for it's ability to do air support, and utility operations. 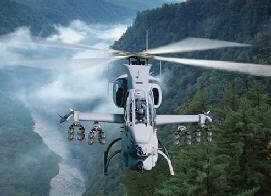 And of course, they update the AH-1W Super Cobra, to the AH-1Z Viper. The Marines don't want the apache. They've got their signiture bird, so does the army. The Army uses the Blackhawk and the Apache, the Marines use the Venom and the Viper. 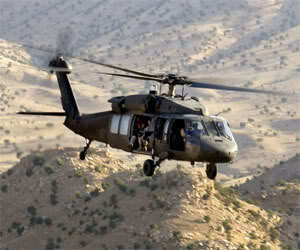 Notice how you can't find a UH-1Y that says ARMY on the side of it. This is the perfect example. You always see a Venom with a Viper. That's what I call, COMBAT AIR PATROL. The UH-1Y variant modernizes the UH-1 design. Its most noticeable upgrade, as compared to previous variants, is a four-bladed, all-composite rotor system designed to withstand ballistics up to 23 mm. A 21-inch (530 mm) insert just forward of the main door has been installed for more capacity. The UH-1Y has upgraded engines and transmission, 170% increased payload over UH-1N, almost 50% greater range and maximum speed, a digital cockpit with flat panel multifunctional displays, and an 84% parts commonality with the AH-1Z. 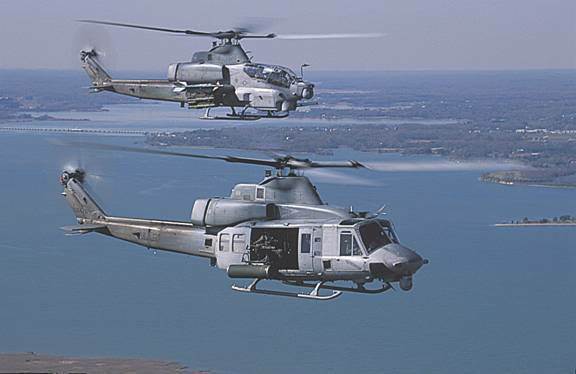 On 8 August 2008, the Marine Corps certified the UH-1Y as operationally capable and was deployed for the first time in January 2009 as part of the aviation combat element of the 13th Marine Expeditionary Unit. The Marine Corps plans to eventually buy 123 of the Y-model Hueys to replace their inventory of N-models, with delivery of all aircraft to be complete by 2016. 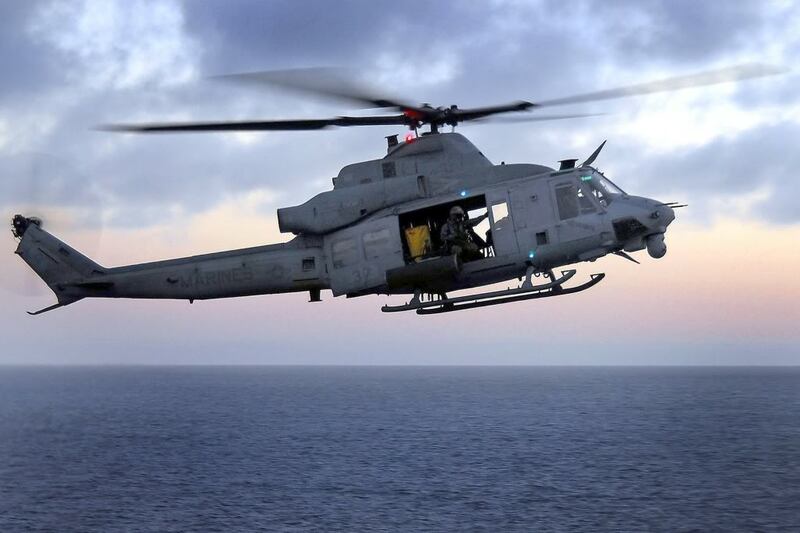 The only operator of the UH-1Y is the United States Marine Corps. An AH-1Z at an air show displaying four-blade rotors and longer stub wings.The AH-1Z's new bearingless, hingeless rotor system has 75% fewer parts than that of four-bladed articulated systems. The blades are made of composites, which have an increased ballistic survivability, and there is a semiautomatic folding system for stowage aboard Amphibious assault ships. Its two redesigned wing stubs are longer, with each adding a wing-tip station for a missile such as the AIM-9 Sidewinder. Each wing has two other stations for 2.75-inch (70 mm) Hydra 70 rocket pods, or AGM-114 Hellfire quad missile launchers. The Longbow radar can also be mounted on a wing tip station. The Z-model's integrated avionics system (IAS) has been developed by Northrop Grumman. The system include two mission computers and an automatic flight control system. Each crew station has two 8x6-inch multifunction liquid crystal displays (LCD) and one 4.2x4.2-inch dual function LCD display. The communications suite combines a US Navy RT-1824 integrated radio, UHF/VHF, COMSEC and modem in a single unit. The navigation suite includes an embedded GPS inertial navigation system (EGI), a digital map system and a low-airspeed air data subsystem, which allows weapons delivery when hovering. The crew are equipped with the Thales "Top Owl" helmet-mounted sight and display system. The Top Owl has a 24-hour day/night capability and a binocular display with a 40° field of view. Its visor projection provides forward looking infrared (FLIR) or video imagery. The AH-1Z has survivability equipment including the Hover Infared Suppression System (HIRSS) to cover engine exhausts, countermeasure dispensers, radar warning, incoming/on-way missile warning and on-fuselage laserspot warning systems. The Lockheed Martin target sight system (TSS) incorporates a third-generation FLIR sensor. The TSS provides target sighting in day, night or adverse weather conditions. The system has various view modes and can track with FLIR or by TV. The only operators of the AH-1Z are the United States Marine Corps.